Driveby Andy: Interior is paneled. Last week went fine with the solar panels held on to the roof with tape. And so far this week it's been going great too. In fact, I don't even check on them most days any more. I'll probably get out the ladder this weekend (or Thursday) and look everything over but at this point I'm pretty confident that my solar panels are staying put. All with no holes drilled in the roof other than the one hole I made to run the wiring through. Not too shabby. 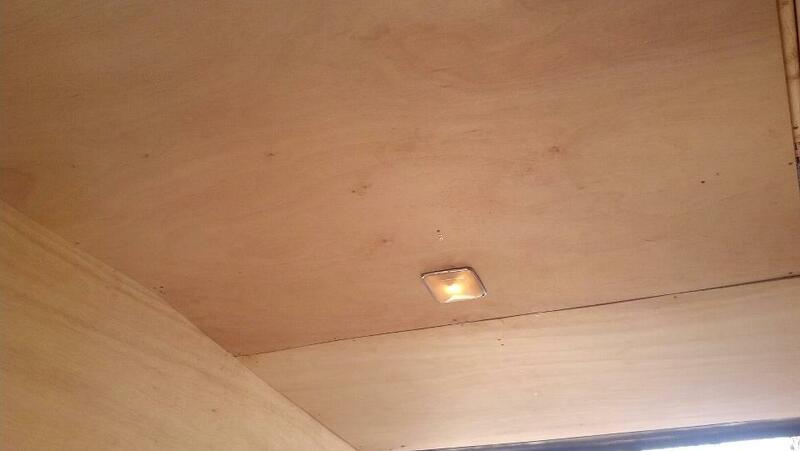 As for last weekend I managed to get the ceiling done in terms of insulation and paneling. And also the lower section of the driver's side that I still had left to do. There's a small section of the ceiling in front over the front seats that I need to do still. That section will require a different frame/support setup. Just need to sit down and plan it out, but to be honest it's not a big concern to me at this point. My next step really needs to be craigslist. I need to list those bench seats on CL for free and hopefully get rid of them quickly and easily as they've been taking up far too much space in the back of the van. 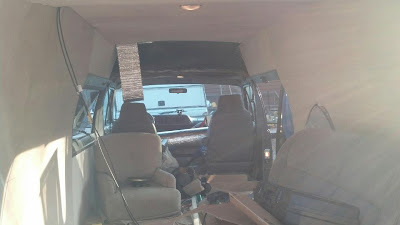 I'm a bit of a hoarder which doesn't bode well with vandwelling and to tell the truth I'd totally be keeping those bench seats if I had room in my storage unit for them. But I don't need them! The brackets that hold them in the van have long been covered up and I can promise you I'd never put the time and effort into tearing everything out of the van just to put those seats back in. The radio in the van died last week. I used to have to hit the dashboard every now and then and it'd come back on but it's officially dead. I had been planning to buy a new radio for months now and I've been putting it off because I didn't want to spend the money. Sometimes I get impulsive because I know otherwise I'd NEVER spend the money. I ordered a new radio and installation kit from Amazon tonight. Should be here Friday so I can install it this weekend. The new one has an aux port so I can hook my phone up to it and listen to Pandora while driving. Yay! You'll see a regular-type chair in one of the pictures below. I bought that for $10 on CL. I don't know if it'll be staying in the van. It came with a swivel base that costs $169 online. No clue if I'll use any of it, but because I knew how much those swivel bases were, I couldn't pass it up. I would love to rig up the swivel base to work with my passenger seat I think. And right now I'm kind of toying with the idea of keeping the chair in there basically in the same spot as it is now but I'd have it permanently facing the side door.